In recent years, the heavy machinery and earthmoving equipment market in Australia has witnessed a surge in demand, largely driven by increased government spending toward infrastructure projects. While earthmoving has a long history of involvement in civil and roadworks projects, market demand has soared as various government development initiatives are undertaken. Over the next ten years, the federal government’s plans for land transport infrastructure is set to improve road and rail links, reduce travel times and support economic growth in rural and regional areas. The Federal government’s plans to link Western Sydney to the city, airport and ports, for instance, is said to create approximately10,000 construction jobs, whilst improving livability as the city continues to experience growing population demands (Department of Infrastructure and Regional Development, 2016). It doesn’t stop there. In Queensland’s South-East, a $1.13 billion, four-year project has commenced to improve conditions on the often bumper-to-bumper Bruce Highway which will be widened by six lanes on the Sunshine Coast between Caloundra Road and the Sunshine Motorway (Brisbane Times, 2016). Rural parts of the state will also experience significant upgrades, aiming to support rural industries through road investments, with four key government-funded road projects targeted in Central and North Queensland (Minister for Infrastructure and Transport, 2016). And it’s no surprise that the government’s investment in infrastructure is so significant and growing. As Australia showcases its ability to construct complex and diverse projects, regions experience increased stability through the creation of local jobs. This is good news for earth moving equipment companies operating in Australia, as construction subcontractors flood into the market to benefit from these lucrative opportunities, while key companies behind the earthmoving machinery meet the ever growing needs of this evolving industry – one that is always looking for new ways to reduce costs by improving operations and efficiency. Those in the construction game are aware that the success of a project weighs heavily on the superior quality and reliability of the equipment. The ongoing support of the supplier also gives developers added peace of mind. Projects undertaken in regional and remote locations require equipment to perform at a high standard under stress, giving clients that extra incentive to expect durability from their equipment. In today’s age, the infusion of cutting edge technology has also become crucial for suppliers catering to the construction sector. As clients’ needs are ever changing to gear them towards new challenges faced in the civil construction sphere; the supplier’s capacity to meet those needs evolves. Technology not only serves to improve performance, but to ensure earthmoving equipment is as durable – and cost effective – as possible. Naturally, the major suppliers in the earthmoving industry are poised to compete for their share of this global, multi-billion-dollar market. So in order to beat the competition, key players strive for new ways to break new ground. And in an industry where every dollar counts, they invest millions in research and development programs. This is evidenced in the technological advancements hitting the market today, largely concerned with improving safety and efficiency, while reducing fuel costs and impact on the environment. Tech advancements in the construction arena include air-conditioned cabins, energy-monitoring systems, automatic transmissions, and GPS (global positioning system) tracking – all designed to enhance operations and increase jobsite safety. Global heavyweight Komatsu has procured a piece of the tech-pie, recently investing A$620 million in their annual research program. Their research has driven the creation of autonomous trucks and other remote-controlled mining and construction equipment, in addition to fuel efficient hybrid excavators and dump trucks. Another big player, Caterpillar, has teamed up with several leading companies in their quest for technological innovation. This includes Australia-based Seeing Machines and France-based Redbird, with the view to offer cost-effective, efficient equipment that improves a customer’s operations. In 2015, their partnership with Seeing Machines offered clients Fatigue-monitoring Telematics devices. The customizable technology is designed to monitor driver fatigue through face and eye analytics in real-time, 24/7. Taking earthmoving safety equipment to a whole new level, the units have kept hundreds of thousands of heavy vehicle operators safe – not to mention improving efficiency through less downtime due to accidents or injury. With so much advancement across the industry, it should be noted that there is still a buoyant market for the resale of earthmoving equipment, with recent research indicating Australian auction clearance rates are in excess of 70% (Institute of Public Works Engineering, 2016). So what is owing to the rise in value of second hand models? It could be the emergence of US buyers who resell equipment parts for spares, in addition to a decrease in the supply of new equipment. Coupled with the increased government spending on infrastructure projects that serve to propel local economies forward, the earthmoving equipment market is in a solid position to match demand across Australia. And it’s a positive outlook moving forward, as competitive global demand is likely to see suppliers continue to develop new ways of offering cutting-edge earth moving machinery, while the resale of late models offers a dynamic market landscape for consumers. For contractors, this means new ways to improve operations and continue to offer safe conditions for workers on the jobsite. 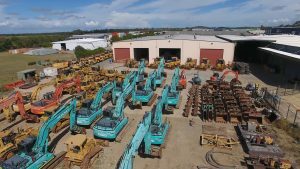 Lloyds Auctions are Australia’s trusted reseller of earthmoving equipment. Click here to browse available stock.